The most recent assignment of Jane Wooliston, the English spy known as the Pink Carnation, leads her to French-occupied Portugal where her task is to locate Queen Maria. The Portuguese monarch was supposed to have been on a ship with others of the royal family on their way to Brazil. Instead she has disappeared. There are several possibilities as to who is behind the disappearance of the queen who, mad and violent though she may be, can still be a useful political tool. Jane knows that it is imperative that she find the queen before the French do. Jane is working at a disadvantage because she no longer has her well-trained cadre of operatives to aid her. Moreover, her knowledge of Portuguese is limited to what she learned in a few weeks study. For the duration of this assignment, she is uncomfortably dependent upon the help of a single agent assigned to her, an agent as famous for his shifting allegiances and his reluctance to follow orders as for his formidable skills. The notorious Moonflower, former French agent, is definitely not an operative with whom Jane would have chosen to work. The Moonflower, also known as Jack Reid, is in Rossio Square in Lisbon as instructed to meet his contact, but he is not expecting that contact to be a dark-haired courtesan wearing Paris fashions. When the courtesan discards her dark curls, greets him by name, and identifies herself as the Pink Carnation, Jack laughs. It seems impossible that this woman with her pure profile and steady eyes could be the spy who struck fear in the hearts of the French. Once he accepts that Jane is the Pink Carnation, he is skeptical of her mission. He advises her to “cut her losses and go home.” Of course, Jane is not about to give up on an assignment, and with no small effort, she persuades Jack to do his part. Soon the two are assuming various disguises and engaged in feats of derring-do as they complete their mission and see the Queen to safety. Other characters from the series make appearances, including the infamous French spymaster, the Gardener, and the indomitable Miss Gwen (now Mrs. Reid and stepmother to Jack). Jane’s story grows more poignant as her flaws and vulnerabilities are exposed, and Jack’s behavior becomes more comprehensible as his point of view is added to what others have revealed. The Lure of the Moonflower concludes Willig’s popular Pink Carnation series. Before Willig wrote the first word of this novel, it was burdened with high expectations. While there are doubtless readers who have sampled a few books in the series, there is also a large core group of readers who have been invested in this series through more than a decade and a dozen books. As a member of this group, I can only say that the concluding book was everything I hoped it would be. Piece by piece, Jane felt herself washing away, like a pebble in a pond, smoothed into featurelessness by the successive waves that crashed over her, until there was nothing left there that was uniquely her own. She wondered dimly what the girl who had first come to Paris five years before would think of the woman she had become. Would she be proud of her achievements? And would she long after all that had been lost? So very, very much lost. Lost ideas, lost ideals, lost comrades. She does indeed have him, and Willig assures us that their life after marriage continues to be extraordinary. Eloise and Colin’s HEA completes the picture. No loose threads to tease and taunt in this one. Mark me one deliciously satisfied reader, albeit one mourning the end of the series. If you have enjoyed other Pink Carnation books, add this one to your TBR immediately. If you have not read any of the other Pink Carnation books, I recommend the full series. Although The Passion of the Purple Plumeria (Book 10) is my top favorite with The Mischief of the Mistletoe a close second, all twelve books are keepers. I know I’ll be rereading them, and I’ll also remind myself that Willig has not ruled out The Return of the Pink Carnation. I've not read her but I have heard of her - this sounds good - thanks. I have had several of the books in this series in my TBR Mountain for a while. I see a marathon read in my future to read the whole series. Don't know how I missed this series. But it's good to know I can start reading them back to back without having to wait for the next book to come out. :). Thanks for the review. I don't know how I missed this series. But I do love waiting for a series to have a few books out so I can read them back to back. Thanks for the review. I came upon this series by accident some years ago when my local bookstore was sold out of the historical mystery I was looking for and I got several "if you like that author, you'll probably like this one" recommendations. I came home that day with "Silent in the Grave" and "The Secret History of the Pink Carnation." I wish the recommendations I get from Amazon were as accurate! I'm a big fan of this series so seeing it end is bittersweet. Like Janga, I have gone back for a re-read while waiting for "The Lure of the Moonflower." First, "The Betrayal of the Blood Lily" where I first met the Reid men, then "The Passion of the Purple Plumeria" which also features the Reid family. It seems like whenever I re-read any of the Pink Carnation books, I also read "The Mischief of the Mistletoe." Although I wasn't expecting much from this book when I bought it - when fans lobby for a book about a secondary character, the results do not always live up to the rest of the series - but I like the series and I loved the cover (and the book was signed) so I added it to the stack of books I was buying that day. In the end, this book became one of my favorites, different from the rest but great in its own way. 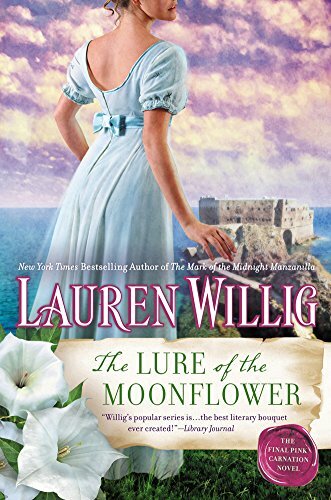 As much as I hated to see the end of the series, "The Lure of the Moonflower" was a very good and satisfying ending. Though Jane as the Pink Carnation is the central figure of the series, each book has focused on another character and to some extent we see Jane as they see her. This is also true of Jack Reid, in that each of his family members whom we've met in earlier books sees him differently. Jane and Jack are multidimensional and complicated characters. Their shared story is everything I hoped for. I'm certain I'll be wanting to read it again before long.